Mention the solution not the problem. 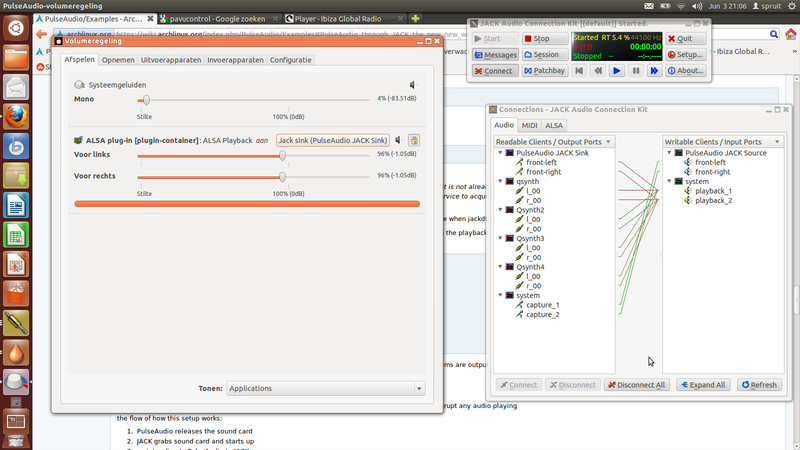 A tip for getting Jack Audio and PulseAudio to work nicely together in Ubuntu 12.04. It took me considerable time, but finally the answer appears to be on ArchLinux. The new new way works for me. Actually quite easy now. It is just one setting in pavucontrol in my case: Route the ALSA stream to the Jack sink. The standard settings in Jack Audio were ok, but check the image for details. I did have to install pavucontrol via Synaptic. Some more tips for setting up Jack Audio with Qsynth. – Add a sound font to all, or at least one, of your engines in Qsynth. Its like writing without ink otherwise (no sound!). Go to engine setup and the tab Soundfonts. – Set the audio driver for your engines in Qsynth to “jack”. Otherwise also no sound. Go to engine setup and the tab Audio. Hier zat nog wel 2 min wandelen tussendoor. You are currently browsing the www.ariebaris.com blog archives for June, 2012.